You may or may not have noticed, but I've been on quite a pie kick these past few months. In April I came up with a delayed resolution to make at least one pie a month for the rest of the year (and hopefully beyond). Not only are pies delicious to eat, but making them is very therapeutic, at least for me. This resolution benefits my stomach as well as my soul. 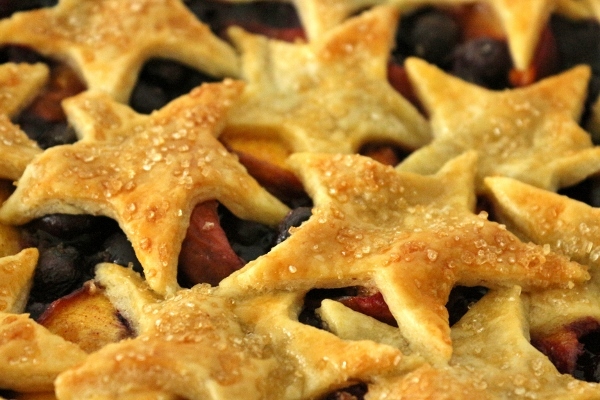 The pie I will be sharing today is the perfect pie for the Fourth of July. 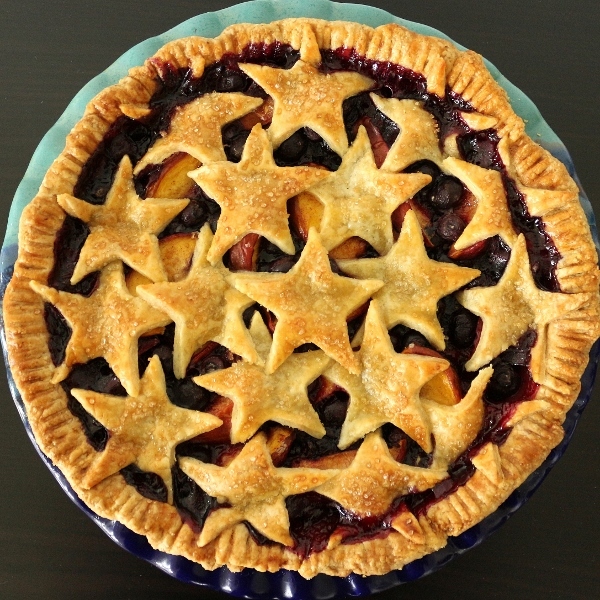 No, it's not exactly "red, white, and blue," but it's blue from the blueberries, maybe a little red from the skin on the nectarines, and you can make it even more patriotic as I did by forgoing the traditional top crust for some overlapping star cutouts. 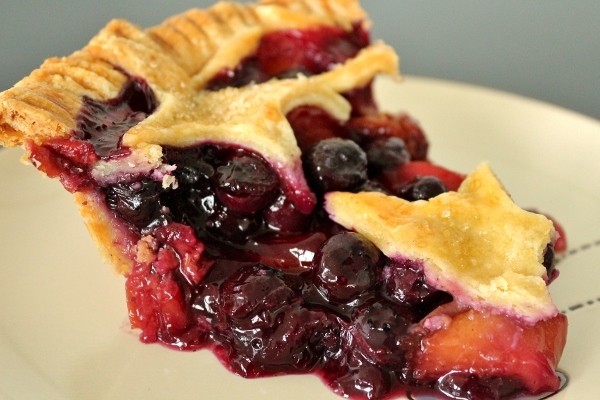 Blueberries and nectarines create a killer combo for the filling in this pie. 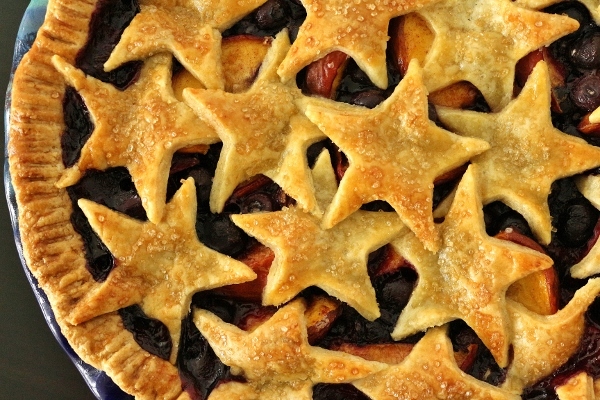 It's heavy on the blueberries with slivers of fresh nectarine studded throughout. The not-too-sweet filling is enhanced with a bit of lemon zest, cinnamon, and vanilla extract, which add a bit of character without overpowering the fruit. We swap out a traditional pie crust for a cornmeal crust, which simply substitutes a bit of the flour with cornmeal to offer some crunch to the flaky dough. 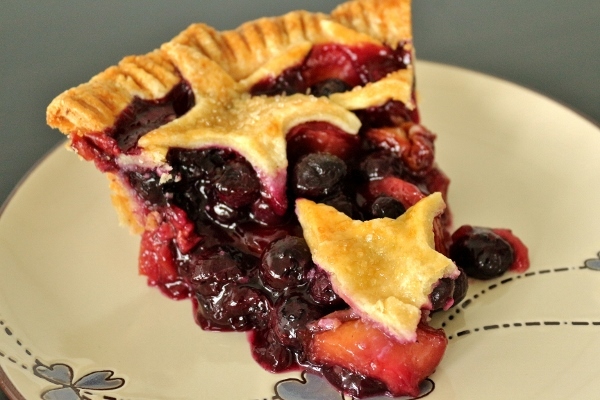 It's excellent, and absolutely worth pairing with the blueberry nectarine filling. I used a different cornmeal crust recipe than the one provided in the original pie recipe. I've made cornmeal crust previously for a maple buttermilk custard pie, and I like the way it turned out so I just stuck with that recipe instead. 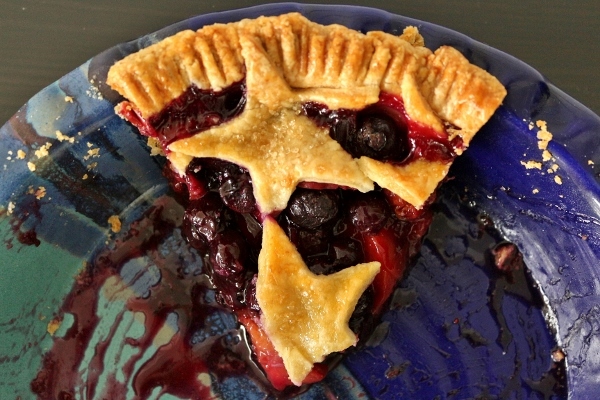 Just a note: I had purchased an insane amount of fresh blueberries on sale a week before making this pie, so I measured out what I needed from my bounty, washed, dried, and then froze the blueberries until it was time to make the pie (so they would remain in their freshest state instead of being week-old blueberries by pie time). Since my blueberries were frozen when added to the pie, it baked significantly longer than the original recipes states. I also find that all of my pies take longer to bake in my electric oven than the recipes state, so part of this may just be my oven (or an electric versus gas oven), but just watch for the visual cues that your pie is done: bubbling fruit, golden crust. Definitely aim for the baking time in the recipe, but if your pie takes longer to bake like mine did (an extra 45 minutes on top of the suggested time in the original recipe), just follow your gut and wait for the signs. If you don't bake it long enough, your filling won't properly set, and you'll have a runny mess instead of thickened, decadent pie filling. 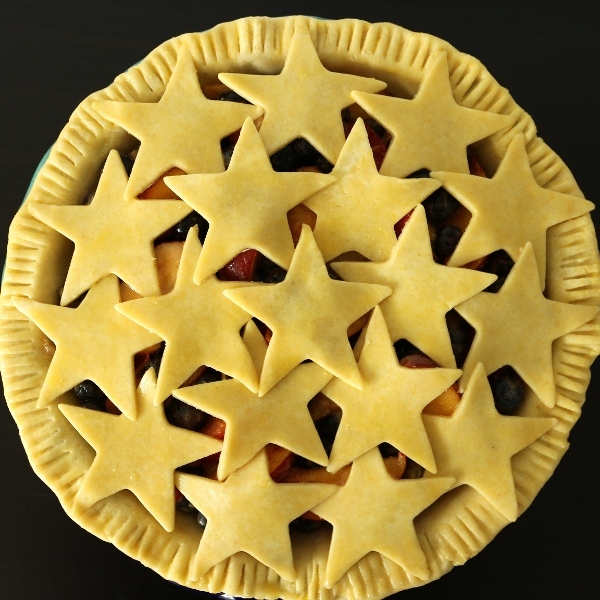 Also, if you choose to use cutouts to top your pie instead of a standard pie round or lattice-top, I recommend brushing the edges of your pie crust with egg wash after filling the pie, and then brushing each cutout with egg wash as you assemble them on top. The egg wash will act as glue to hold the cutouts in place as you overlap them, and it will be easier to brush them with egg wash beforehand rather than doing it after they are already on the pie. 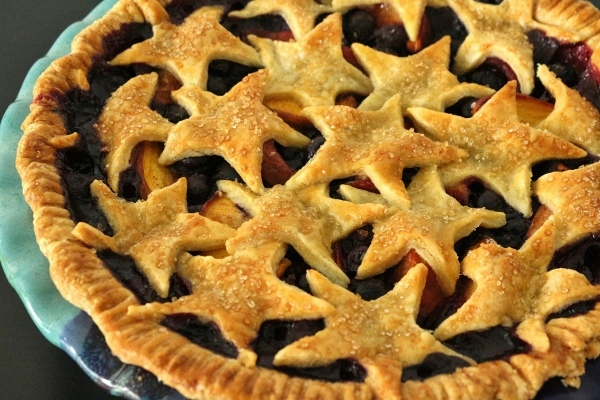 This blueberry nectarine pie is truly extraordinary! While selecting a favorite pie is much like picking a favorite child (who knows, maybe that's easier for some folks than others), I would take the liberty of stating that this pie just might be my favorite fruit pie I've ever made, or at least my favorite summer fruit pie. I made it recently for guests, and everyone (and I mean EVERYONE) had seconds. It doesn't contain any weird or hard-to-find ingredients, it's actually quite simple and straightforward, and yet there isn't a single thing I would change. As I stated earlier, it's not too sweet, so the natural flavor of the fruit shines through, and the toothy cornmeal crust is the perfect compliment for the fruits within. 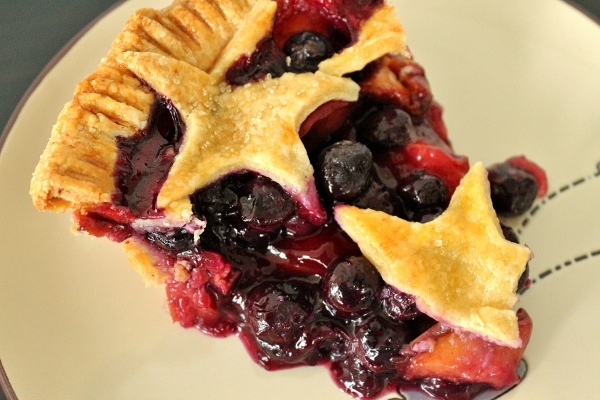 Trust me, this is your new favorite summer pie! Make the crust: Stir the flour, cornmeal, salt, and sugar together in a large bowl. Add the butter pieces and coat with the flour mixture using a spatula. With a pastry blender, cut the butter into the flour mixture, working quickly until mostly pea-size pieces of butter remain (a few larger pieces are okay; be careful not to overblend). Combine the water, cider vinegar, and ice in a large measuring cup or small bowl. Sprinkle 2 tablespoons of the ice water mixture over the flour mixture, and mix and cut it in with a bench scraper or spatula until it is fully incorporated. Add more of the ice water mixture, 1 to 2 tablespoons at a time, and mix until the dough comes together in a ball, with some dry bits remaining. Squeeze and pinch with your fingertips to bring all the dough together, sprinkling dry bits with more small drops of the ice water mixture, if necessary, to combine. Shape the dough into a flat disc, wrap in plastic, and refrigerate for at least 1 hour, preferably overnight, to give the crust time to mellow. Wrapped tightly, the dough can be refrigerated for 3 days or frozen for 1 month. Preheat the oven to 425°F. Roll out half of the dough into a circle about 11 inches in diameter. Transfer it to a 9-inch pie plate. Trim the overhang to 1 inch and refrigerate the crust. 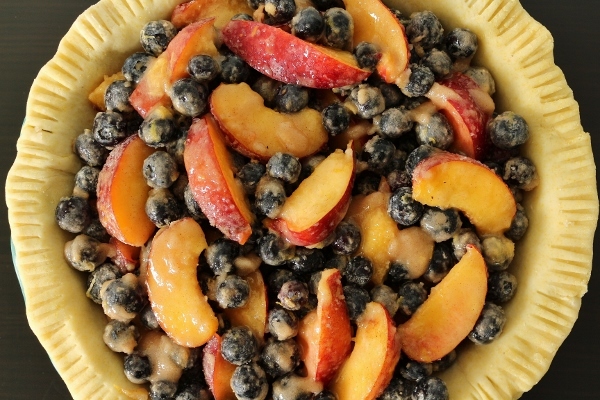 Make the filling: In a large bowl, toss together the nectarines, berries, lemon zest, and vanilla. In a separate bowl, mix together the sugar, cornstarch, cinnamon, and salt. 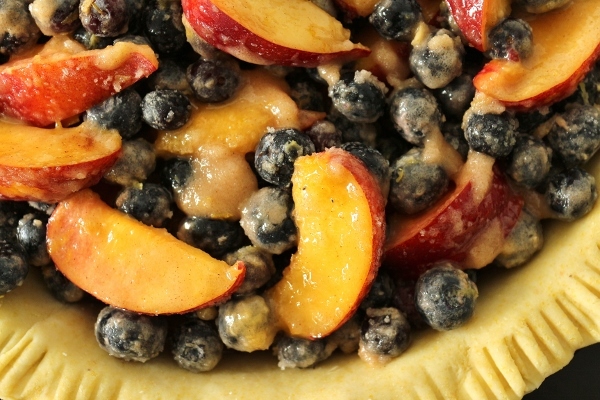 Just before adding the filling to the pie plate, toss the fruit in the dry ingredients. Brush the rim of the bottom crust with egg wash or milk. Roll out the second half of the dough into a circle about 11 inches in diameter. Lay it over the filled pie. Trim the edges, and tuck the top crust over the rim of the bottom crust to form a tight seal. Crimp the edge into whatever pattern you like. 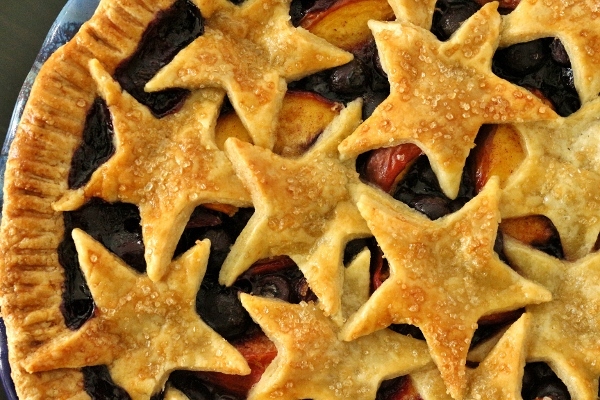 Brush the top crust with egg wash or milk, sprinkle it with raw sugar, and cut a few slits to allow steam to escape. Put the pie on a baking sheet and bake it for 20 minutes, turning it once halfway through. Lower the temperature to 350°F and bake it for 30 to 40 minutes more, until the crust is golden and fully baked and the juices have thickened (mine required an additional 85 minutes, believe it or not, but my blueberries started out frozen and needed more time to catch up--the key is to watch for the visual cues to know it's done ie bubbly juices. If the edges of your crust brown too quickly, use a pie shield or tent the edges with foil). Remove the pie to a rack to cool completely, at least 1 hour. This pie can be refrigerated for up to 1 week, covered in plastic wrap. Let it come to room temperature before serving, or warm it in a low oven. It can be kept frozen for up to 2 months: Wrap it in plastic, then in foil, and let it come to room temperature before serving.